Objective: To investigate the inhibitory effect of β-Elemene alone or combined with chemotherapy drugs on diffuse large B cell lymphoma cell strain OCI-LY8 in vitro. Methods: The optimum cytotoxic concentration of β-Elemene was determined by MTT method. After combining different concentrations of β-Elemene with chemotherapy drugs, the cell death rate was calculated according to the OD values in 24 h, 48 h and 72 h, respectively. The data was analysed using SPSS 13.0. All tests were conducted in triplicate. Results: The inhibitory effect of β-Elemene combined with VM-26 was relatively stronger under the same condition. But in the different time interval unites the cell death rate showed non-statistics difference between the five different chemotherapy drugs, P>0.05. Conclusion: Single drug of β-Elemene could induce apoptosis tumor cells to a certain extent, and also there was synergized action combined with chemotherapy drugs; but there were no significant differences between these drugs when combined with β-Elemene. Primary Central Nervous System Lymphoma (PCNSL) is rare, which accounts for about 3% of primary intracranial tumors. According to the literature in recent years [1,2], PCNSL had increased, especially in the middle-aged and elderly population above 65 years old; and most of PCNSL are B-cell non- Hodgkin's lymphoma, most of which are diffuse large B cell lymphoma (DLBCL). Currently, treatments for PCNSL are mainly chemotherapy such as suing HD-MTX, HD-Ara-C, or radiotherapy according to NCCN Guide [3-10]. However, the treatment effects are not good enough and recurrence always occurs in short term. Meanwhile, the side effects of chemotherapy and radiotherapy are very obvious, such as neurotoxicity, brain white change which can cause significant impacts on the life quality of patients. In the present study, we hope that by selecting some of the clinical drugs which can penetrate into the Blood-Brain Barrier (BBB), and testing its inhibitory effect on DLBCL cells, we can find some possible or better treatment strategies for PCNSL. Among these drugs, β-Elemene, which are extracted from the traditional Chines medicine and belongs to the plant of antineoplastic drugs, attracted our attention. Previous studies showed that β-Elemene has various of bio-activities, such as inducing autophagy, inhibiting the growth and survival of both platinum-sensitive and -resistant ovarian tumor cells, and son on [11,12]. What's more, β-Elemene has a low molecular weight, 204.35, as well as low toxicity, can also penetrate into the blood-brain barrier [13,14]. And it is not only effective for treatment of normal intracranial tumor, but also has synergistic effect when it is combined with chemotherapy. Thus, in this study, we aimed to investigate the inhibitory effect of β-Elemene alone or combined with chemotherapy drugs on diffuse large B cell lymphoma cell strain OCI-LY8 in vitro. Materials: Human primary diffuse large B-cell lymphoma cell line OCI-LY8 (Shanghai Nuochen Biology Co, Ltd); DMEM medium (Hyclone) (Thermo Fisher Scientific, USA); β- Elemene injection (Dalian HOLLEY Jingang Pharmaceutical Co., Ltd., China), Dacarbazine (DTIC) (Nanjing Pharmaceutical Co., Ltd., China), Teniposide (VM-26) (Nanjing Pharmaceutical Co., Ltd., China), Cisplatin (DDP), and Methotrexate (MTX) (Shanghai Lang Lang Biotechnology Co., Ltd., China), Nimustine (ACNU) (Hainan General Alliance Pharmaceutical Co., Ltd., China). Co., Ltd., China), Nimustine (ACNU) (Hainan General Alliance Pharmaceutical Co., Ltd., China). Amplified cultivate the cells which were in good condition were input into cell incubator at 37°C and 5% CO2. Cells were digested in logarithmic growth phase. Then cell suspension was adjusted into concentration of 5 × 105/ml, following by addition into 96-well plate (200 μl) and incubated at 37°C, 5% CO2. After 80% cell adhesion, β-Elemene was added; the drug concentration was set as 50 μg/ml, 75 μg/ml, 125 μg/ml, 150 μg/ml, 200 μg/ml, 250 μg/ml, 500 μg/ml, 1000 μg/ml. Each group was conducted in triplicate, and then MTT assay wasn't performed at 24 h, 48 h, 72 h. Briefly, 20 μl MTT was added in each hole, cells were continued to cultivate for 4 h, the supernatant was removed and 150 μl DMSO was added. Then a microplate reader (Thermo Scientific, USA) was used to detect the absorbance under 492 nm. IC50 values were calculated, and then the proper concentrations were chosen as the ones which were used in combination with chemotherapy drugs. In this section, two groups were set, the blank group and experimental group. The blank group was OCI-LY8 cell group which was not added drug. For the experimental group, the concentration of chemotherapy drug in experimental group was listed as follows, according to both references and our previous experiments: DTIC 30 μg/ml, VM-26 1 μg/ml, DDP 2 μg/ml, MTX 1 μg/ml, ACNU 50 μg/ml [15-19]. Then different concentrations of β-Elemene (25 μg/ml, 50 μg/ml, 100 μg/ml) were added. Then cells were stained by β-gal dyeing, in which the aging, apoptotic cells would change to green, and after 24 h and a 200X microscope was used to observe and photograph so as to find out the optimal concentration. The calculation formula for cell toxicity (death rate) was: cell toxicity (death rate) (%)=(1-expeimental group's OD value/blank group's OD value) ) × 100%. All the experiments were conducted in triplicate through the whole study. SPSS13.0 software was used to analyse data with One-Way ANOVA method. The statistical significance of differences was set at P<0.05. 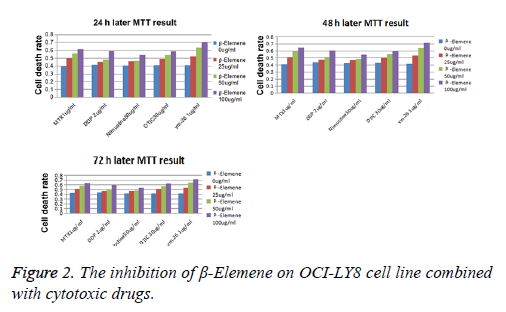 β-elemene was added under different concentrations into OCILY8 cells, when time was up to 24 h, 48 h and 72 h, the IC50 values of β-Elemene on DLBCL cell lines were 404.75 μg/ml, 216.33 μg/ml and 185 μg/ml, respectively (Figure 1). In order to get a better reflection about the discrepancy for different doses in combination with chemotherapy drugs, depending on the experiment data changes, the test concentration of β- Elemene adjust to 25 μg/ml, 50 μg/ml and 100μg/ml, lower than the IC50 values to better demonstrate different effects on combination with different chemotherapy drugs. Figure 1: The β-Elemene IC50 data analysis. The results for cell toxicity (death rate) were shown in Figure 2. Results suggested that β-Elemene combined with chemotherapy drugs had a synergistic effect. In the same concentration of β-Elemene conditions, the combination of VM-26 group had the highest cytotoxicity, as well as the highest inhibition rate. The results of One-Way ANOVA method between different chemotherapy drugs in each period of time showed that P value of 24 h among the groups was 0.0577, P value of 48 h was 0.0660, and the P value of 72 h was 0.0602, indicating no statistically significant difference between the five groups of chemotherapy drugs combined with β-Elemene in the cell death rate. 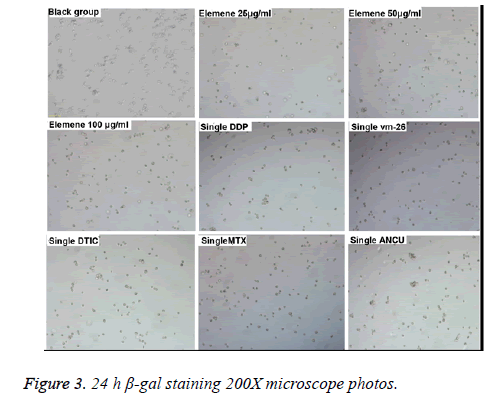 24 h β-gal staining microscope 200X photos of the blank group and the experimental group were shown in Figure 3. Figure 2: The inhibition of β-Elemene on OCI-LY8 cell line combined with cytotoxic drugs. Figure 3: 24 h β-gal staining 200X microscope photos. In the view of the characteristics of PCNSL with strong invasiveness and easy to relapse, lots of targeted researches and trials are ongoing. For examples, Siegal  has brought us some new hope in the analysis of the efficacy in PCNSL patients treated combined with rituximab. For patients in the early postoperative period or without a complete closure of the blood brain barrier, the use of HD-MTX in combination with rituximab can achieve a better response rate. Wang Yong et al. have achieved relatively good results in clinical practice in the treatment of patients with recurrent PCNSL who were trying to use a large dose of the pemetrexed. 7 patients with recurrence of PCNSL achieved CR in 2 patients, PR in 3 patients. Aimei et al. in the study of peripheral malignant lymphoma cell multidrug resistance mechanism found that β- elemene could inhibit the growth of tumor cells and improve its resistance. The found of Dayue et al. in the study of the inhibition of Raji cell line in vitro, let us see the hope for β- Elemene in the treatment of lymphoma . Elemene is kind of plant antitumor drugs, which is independent research in China and extracted from Zingiberaceae plant wenyujin (Rhizoma zedoariae). 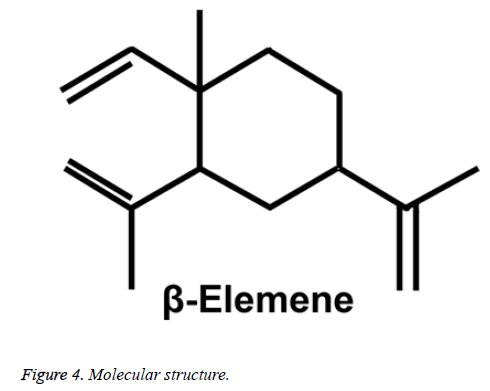 The main component of Elemene is β-Elemene (β-1-methyl-1-vinyl-2,4-di-isopropenylcyclohexane; Figure 4), similar to the structure of paclitaxel, but no toxicity related groups, molecular weight of only 1/4 of the paclitaxel. In recent years, the deepening of the studies have shown that β-Elemene can be used as a safe and effective liposomal antitumor drug in the treatment of breast cancer, lung cancer, brain tumor, digestive tract tumor, bone cancer, migrant pleural effusion and so on [24-28]. At the same time, β-Elemene recently achieved some results which progresses by leaps and bounds in promoting tumor cell apoptosis, reversing tumor cell strains [29-36]. In addition, β-Elemene also plays a synergistic effect when it combined with chemotherapy, radiotherapy, hyperthermia and other multidisciplinary treatment [37-43]. So in view of the above research results and the characteristic of that β-Elemene can enter the Blood Brain Barrier (BBB), this study attempt to use β-Elemene to run cytotoxicity test for human source DCBCL cell lines which is the primary pathological cell of PCNSL, to further observe and validate that whether β-Elemene can inhibit activity of human source DCBCL cell lines and play a synergistic effect when it is combined with the commonly used chemotherapy drug for PCNSL or not. Some satisfactory results are obtained. Test data showed that single drug of β-Elemene in vitro could inhibit activity of tumor cells and play a synergistic effect when it was combined with five kinds of chemotherapeutic drugs respectively, and the cell killing effect of combination with VM-26 was relatively strong. Therefore, we believe that the curative effect of VM-26 combined with β-Elemene is potential in the treatment of PCNSL patients. Also in elderly patients with recurrent PCNSL who have poor constitution, based on the advantage of the mild adverse reaction of β- Elemene, single drug therapy can yet be regarded as a reasonable choice. There are, of course, some differences between cytological experiment and human therapy. The dose of β-Elemene for treatment in the human body needs further refinement and adjustment. The effects and problems of the treatment remain us to explore and demonstrate. Obrien PC, Seymour JF. Progress in primary CNS lymphoma. Lancet 2009; 374: 1477-1478. Wang C, Carnevale J, Rubenstein JL. Progress in central nervous system lymphomas. Br J Haematol 2014; 166: 311-325. Ferreri AJ, Reni M, Foppoli M, Martelli M, Pangalis GA. High-dose cytarabine plus high-dose methotrexate versus high-dose methotrexate alone in patients with primary CNS lymphoma: a randomised phase 2 trial. Lancet 2009; 374: 1512-1520. Korfel A, Schlegel U. Primary CNS lymphoma. Progress in the diagnostics and therapy. Nervenarzt 2015; 86: 710-712, 714-715. Roth P, Stupp R.Treatment of primary CNS lymphoma. Curr Treat Opt Neurol 2012; 16: 1-14. Korfel A, Schlegel U. Diagnosis and treatment of primary CNS lymphoma. Nat Rev Neurol 2013; 9: 317-327. Dahiya S, Murphy ES. Recurrent or refractory primary central nervous lymphoma: therapeutic considerations. Expert Rev Anticancer Ther 2013; 3: 1109-1119. Prica A, Chan K, Cheung M. Combined modality therapy versus chemotherapy alone as an induction regimen for primary central nervous system lymphoma: a decision analysis. Br J Haematol 2012; 158: 600-607. Defeng Z, Liren Q, Jianliang S. Combined treatment of rituximab, idarubicin, dexamethasone,cytarabine, methotrexate with radiotherapy for primary central nervous system lymphoma. J Cell Mol Med 2014; 18: 1081-1086. Jing L, Ye Z, Qu J. β-Elemene-induced autophagy protects human gastric cancer cells from undergoing apoptosis. BMC Cancer 2011; 11: 183. Lee RX, Li QQ, Reed E. β-elemene effectively suppresses the growth and survival of both platinum-sensitive and -resistant ovarian tumor cells. Anticancer Res 2012; 32: 3103. QQ L, RX L. Anticancer activity of β-Elemene and its synthetic analogs in human malignant brain tumor cells. Anticancer Res 2013; 33: 65-76. Tz Z, Xm L. β-Elemene inhibits proliferation through crosstalk between glia maturation factor β and extracellular signal-regulated kinase 1/2 and impairs drug resistance to temozolomide in glioblastoma cells. Mol Med Rep 2014; 10: 1122-1128. Engesæter BO, Sathermugathevan M, Hellenes T. Targeting inhibitor of apoptosis proteins in combination with dacarbazine or TRAIL in melanoma cells. Cancer Biol Ther 2011; 12: 47-58. Huff LM, Lee JS, Robey RW. Characterization of gene rearrangements leading to activation of MDR-1. J Biol Chem 2006; 281: 36501. Zhou Y, Ling X L. Establishment of a cisplatin-induced multidrug resistance cell line SK-Hep1/DDP. Chinese J Cancer 2010; 29: 167-171. Patel O, Karnik K, Macreadie IG. Over-production of dihydrofolate reductase leads to sulfa-dihydropteroate resistance in yeast. Fems Microbiol Lett 2004; 236: 301-305. Numata M, Hata H, Shiomi T, Matsunaga T, Mori T. Identification of cellular defect in UVS1, a UV-sensitive Chinese hamster ovary mutant cell line. Cancer Res 1993; 53: 495-499. Tali S. Primary central nervous system lymphoma: Current state of anti-CD20 therapy and appraisal of reported response criteria. J Clin Neurosci 2014; 21: 709-715. Wang Y, Wang X. Curative effect of pemetrexed on the treatment of relapsed primary central nervous system lymphoma. Chinese J Hematol 2014; 35: 46-49. Feng A, Zhao P. Influence of clemene on MDR of the lymphoma cell and its mechanism. Chinese J Cancer Prevent Treat 2012; 19: 1149-1152. Han D, Zhang C, Gong M. Effects of elemene combined with hyperthermia on proliferation of Raji cells and its mechanisms. J Mod Oncol 2013; 21: 957-960. Peng X, Zhao Y, Liang X. Assessing the quality of RCTs on the effect of β-elemene, one ingredient of a Chinese herb, against malignant tumors. Contemp Clin Trials 2006; 27: 70-82. Xu HB, Zheng LP, Li L, Xu LZ, Fu J. Elemene one ingredient of a Chinese herb, against malignant tumors: a literature-based meta-analysis. Cancer Investig 2013; 31: 156-166. Guan C, Liu W, Yue Y. Inhibitory effect of β-elemene on human breast cancer cells. Int J Clin Exp Pathol 2014; 7: 3948-3956. Zhang J, Zhang H. β-Elemene reverses chemoresistance of breast cancer cells by reducing resistance transmission via exosomes. Cell Physiol Biochem Int J Exp Cell Physiol Biochem Pharmacol 2015; 36: 2274-2286. Taixiang W, Rui D, Xiaoyan C. Elemene for the treatment of lung cancer. Br Med J 2006; 40: 1114. Yu Z, Wang R, Xu L. β-Elemene piperazine derivatives induce apoptosis in human leukemia cells through downregulation of c-FLIP and generation of ROS. Plos One 2011; 6: 107-112. Chen X, Wang Y, Luo H, Luo Z, Zhang T. β-elemene acts as an antitumor factor and downregulates the expression of survivin, Bcl-xL and Mta-1. Mol Med Rep 2012; 6: 989-995. Bin Z, Xia Z. Investigation of elemene-induced reversal of tamoxifen resistance in MCF-7 cells through oestrogen receptor a (ERa) re-expression. Breast Cancer Res Treat 2012; 136: 399-406. Li QQ, Lee RX. β-Elemene enhances susceptibility to cisplatin in resistant ovarian carcinoma cells via downregulation of ERCC-1 and XIAP and inactivation of JNK. Int J Oncol 2013; 43: 721-728. Zhan YH, Liu J. β-Elemene induces apoptosis in human renal-cell carcinoma 786-0 cells through inhibition of MAPK/ERK and PI3K/Akt/ mTOR signalling pathways. Asian Pac J Cancer Prev 2012; 13: 2739-2744. Ding XF, Shen M. 13, 14-bis (cis 3, 5-dimethyl-1-piperazinyl)-β-elemene, a novel β-elemene derivative shows potent antitumor activities via inhibition of mTOR in human breast cancer cells. Oncology Lett 2013; 5: 1554-1558. Shi H, Liu L, Liu L, Geng J, Zhou Y. β-Elemene inhibits the metastasis of B16F10 melanoma cells by downregulation of the expression of uPA, uPAR, MMP-2, and MMP-9. Melanoma Res 2014; 24: 99-107. Fu TH, Li JY, Jing YY. Effect of elemene on reversing chemoresistance to adriamycin in human stomach cancer cell line. J Chinese Med Mater 2013; 36: 601-603. Cao Z, Zhou X. Clinical efficacy of Elemene injection to treat non-small cell lung cancer (NSCLC) with chemotherapy: A meta-analysis. J Mod Oncol 2013; 21: 1237-1242. Xu XW, Yuan ZZ, Hu WH, Wang XK. Meta-analysis on elemene injection combined with cisplatin chemotherapeutics in treatment of non-small cell lung cancer. Zhongguo Zhong Yao Za Zhi 2013; 38: 1430-1437. Yanzhi B, Dongxiang Z, Yang L. The clinical research of elemene emulsion combined with FOLFOX4 regimen in the treatment of advanced gastric carcinoma. Chinese German J Clin Oncol 2012; 11: 336-339. Dong H, Jin F. Postoperative radiotherapy combined with elemene for brain glioma. Chinese J Clin Oncol 2008; 35: 858-860. Li G, Xie B, Li X. Down-regulation of survivin and hypoxia-inducible factor-1 a by β-elemene enhances the radiosensitivity of lung adenocarcinoma xenograft. Cancer Biother Radiopharm 2012; 27: 56-64. Zou K, Liu C, Zhang Z, Zou L. The effect of elemene on lung adenocarcinoma A549 cell radiosensitivity and elucidation of its mechanism. Clinics (Sao Paulo) 2015; 70: 556-562. Song XW, Zhang H, Zheng WH. The influence on apoptosis and life cycle of MCF-7 mammary adenocarcinoma cell inducing by Elemene combined with thermotherapy. Chinese J Lab Diagn 2010; 14: 1527-1529.